Chancellor George Osborne has revealed the government’s plan to sell its remaining stake in Royal Mail, as well as making £3 billion worth of further cuts to public spending. All unprotected departments will be hit by the cuts with the Ministry of Defence (MoD), the Department for Education and the Department for Business, Innovation and Skills taking heavy cuts of almost £1.5 billion collectively. Osborne also announced £500 million of defense cuts, which suggest the government is not on track to meet the symbolic 2 percent of GDP target required of NATO member states. The government will further sell its £1.5 billion share in Royal Mail, Osborne said, following speculation that it may have been undervalued by £1 billion. “I am today announcing that the government will begin selling the remaining 30 percent shareholding we have in the Royal Mail. 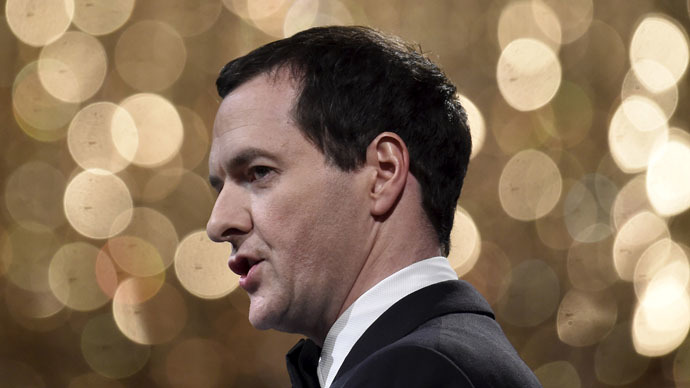 “For as everyone knows, when it comes to living within your means, the sooner you start the smoother the ride,” Osborne said. The Institute for Fiscal Studies (IFS) said the proposed government cuts were twice as deep as the Tories had originally pledged because the cost of protecting the NHS, schools and aid budgets had left other departments vulnerable. The IFS added that the Conservatives had been “misleading” when they said only £13 billion of further cuts would be required. They claim it will take a total of £33 billion worth of cuts to unprotected departments. This equates to 15 percent over the next three years, or 37 percent since 2010. On defense, US President Barack Obama is expected to use the upcoming G7 summit in Germany to quiz the UK about its commitment to the 2 percent NATO target. Osborne’s announcement came as the People’s Assembly Against Austerity held a press conference, featuring celebrities such as singer Charlotte Church. Church called on the public to support the June 20 mass demonstration against austerity, saying the government had “misled” the public. She said her wealth had always been overestimated and she would be happy to pay a higher rate of tax if it helped stop spending cuts.